Life is too short to listen to bad headphones is the tagline on the Monster gratitude packaging. However given the thumping I had given the Monster DNA and Beats (when under monsters control) I must admit I chuckled inward in expectance of yet more marketing over substance. It wasn't long after my review of the Vsonic GR07 BE where I had stated at they might just be the best option without getting into customs that I was sent a brand new pair of gratitudes with the promise that there sound sig is a mix of the GR07 BE and one of my all time favourites the Yamaha EPH-100. Holy smokes there is just an all out air of grandeur with the packaging on these things. The box is solid with pull tabs great graphics and colour scheme and both the phones, carry case and tips are presented oh so classily. Personally I love it. Wow. Have you ever seen so many tips in your life? I had thought that the selection of tips that come with the Vsonic GR07 was great but in time I have come to realise that one maybe 2 are of any use. However the Gratitudes come with just simply outstanding tips. They multi-flanges are great as are the regular silicones but it is the monster super-tips that stand out. Simply put the super-tips are without a doubt the best tips available in the market, they flat out destroy comply and will last much much longer whilst being even superior in comfort. Essentially they are the regular monster tips with the innards filled with a gel which forms with the contours of your ear canal in a way that feels eerily similar to my silicone customs. In the box you also get not one but 2 cases that are of great quality and look stunning, one for your DAP and one for your phones. The DAP case fits the Ibasso DX50 like a glove but will also accommodate a ipod+amp stack just as easily. You get a shirt clip and a manual which has some literature about the connection between the phones and their link to live sounding music and the band Earth Wind and Fire. Its not really important but im sure most people enjoy the little extras. Looks and Build Quality – (9.5/10) Straight up classy. I would put the gratitudes up there as the Sennheiser Momentums of the IEM world. They ooze class and high quality aesthetics. From the unique design of the housing to the beautiful jack and almost ergonomically perfect inline microphone and controls. I have not held a better looking set of phones and this is evident in just how many people have asked me what they are. The cord at first is strange but after a week or 2 settles down brilliantly, it is supple, low on micro phonics and unlike almost all flat cables (im looking at you sony) do not drive me crazy and might actually be now preferred to that of the Vsonics. Both are excellent of course but the vsonic is a touch heavy for me although this is really nit picking. Yet again this category comes down to the tips and yet again with the supertips in they stay put by gripping the inner ear and melding to it. Its been a long time since I have enjoyed using a IEM downward, preferring those that go over ear on a day to day basis. By the tips keeping these so securely in place I found them a breeze to use popping in and out and not once have they fell out/lost seal in over 2 weeks of using them almost exclusively, thats rather impressive. Ok so usually I don't defer from .0/.5 ratings but in this case I feel it was necessary. Given that I gave the GR07 BE a 9/10 and feel that these are a step up yet again for sheer enjoyment. Not on the level of my miracles that get a 10 being the best I heard. Certainly the Gratitudes are my top IEM recommendation list right now. Straight off the bat you should notice just how grand and open the presentation of the gratitudes is. Its simply huge open and airy, incredible on live albums. Also to do with the presentation is that of the incredibly 3d soundstage. This it is an eery effect that I had is best compared to if you ever owned the once remarkably popular EPH-100 it simply put adds an element of sound that other phones struggle to replicate. This 3d feeling makes them incredibly fun to listen to. Again as a comparison the monsters seem to do everything that GR07 BE do but a little better a lot grander and a lot more 3d. They are more engaging and analogue sounding. Treble at first was a bit sharp but has settled down to the point that I haven’t noticed any sibilance. Its still very nice but the mids and bass are so good it does get overshadowed not because of a deficiency rather due to the other ranges just being brilliant. Bass is great It is razor tight but rumbles with authority that comes close to the Denon Urban Ravers. Drums are on point and bass guitar notes are great also. It would be safe to say that the Gratitudes do have a bass edge on them but in a very engaging and non fatiguing way. Again soundstage is incredible, as out of head as any of the best IEM's and that oh so lush 3d sound that the EPH were once the kings of. Since I had received the gratitudes before the Ibasso DX50 I did spend sufficient time conducting the review in the same manner as usual. In the past week or so I have been on holiday and with not wishing to annoy the good lady as much as usual by dragging 10+ sets of phones and amps with me (I have become a master of sneaking and amp or set of IEM's into her shoes and make up bag to leave more luggage allowance available for a selection of cables and other tech in my own). I had decided this will be one set of phones and one Dap (plus the Sony B-series and UE600 for the gym of course) for my listening pleasure. The choice was easy, the monsters and the DX50 were no brainers. They go together in perfect harmony, both feeding off on anothers strengths and eliminating there weaknesses. This truly is the a perfect partnership, only my UM miracles could maybe be preferred but are and extra hassle popping in and out on the beach etc (plus I am terrified of damaging them). Right now im listening to Bob Marley Legend Remasterd 24bit and am literally blown away at the detail and intimacy. The Monster Gratitude have well and truly shocked me when the were first released I thought about jumping on them at around £200 realised they were made by monster and would most likely be junk. Monsters record of making craptastic or average headphones at an astronomical price and the mostly disgusting business practices of suing just about anyone while flat out lying to consumers about there overpriced junk cables (end rant) would be enough to make most people give them a wide berth. That said the gratitudes are nothing short of outstanding, unfortunately I think they will never find the credit that they are due in the enthusiast community simply for the way in which Monster have performed in the past along with the association with the infamous Beats line. This is coupled with the head-fi pack mentality will mean that they are no doubt overlooked. What that has achieved though is that at present the asking price for these IEM's is a jaw dropping low £50. Simply put there is nothing that comes close at that price let alone many times more and those that actually care for an enjoyable engaging 3d mid and bass presentation will love these and so will their wallet. 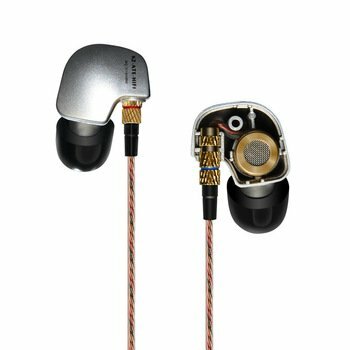 The new low price aside these are so unbelievably good that they are now the only earphones I use unless on a daily basis.